2020 THANKSGIVING -a view of the future! Yet it wasn’t the game that Winston was uninterested in. It was more the thought of eating another TofuTurkey. Even though it was the best type of VeggieMeat available after the government revised the American Anti-Obesity Act of 2018, adding fowl to the list of federally-forbidden foods, (which already included potatoes, cranberry sauce and mince-meat pie), it wasn’t anything like real turkey. And ever since the government officially changed the name of “Thanksgiving Day” to “A National Day of Atonement” in 2020 to officially acknowledge the Pilgrims’ historically brutal treatment of Native Americans, the holiday had lost a lot of its luster. Where Are All My Facebook Friends? "Have you noticed that you are only seeing updates in your newsfeed from the same people lately? Have you also noticed that when you post things like status messages, photos and links, the same circle of people are commenting and you are not hearing from anyone else? YOU ARE STILL INVISIBLE to a large portion of your list. If you want to re-establish contact, you will need to get the word out to ALL of your contacts by inviting them to this "event" or creating one of your own so they can read the post and adjust their settings. Click on "Attending" at the top and then you will see an option to invite your friends under the smiley face. It’s public so everyone who logs onto Facebook can view it and even the friends who can’t see your posts WILL see the event invitation. You can also tweet about it, create a blog post or send out an email to your subscribers in hopes of reaching them all." Being a Southern California resident has motivated me to keep an eye on earthquakes. One key to understanding earthquakes is tectonic pressure. Tectonic pressure builds up between plates and is released when the plates slip over, under or sideways relative to each other. Another curiosity is how little gravitational influences are discussed in relation to earthquakes, so I began forming a hypothesis. Some moons in the solar system are heated by the gravitational push and pull exerted upon them by their planets. Our moon pulls on Earth enough to cause tides upon trillions of tons of water. After large solar flares eject billions of tons of charged particles near Earth, it is logical to assume that this gravitational influence would cause additional tectonic pressure. The recent Honshu earthquake moved Japan east. This would seem to infer that on the opposite side of the associated tectonic plates there would be a pressure change. Either an increase or decrease in pressure could start a chain reaction of earthquakes as the pressure equalizes between connected tectonic plates. If we add a few billion tons of gravity to the cycle, should we see an increase in large quake frequency? 6.6 15 Jun 2011 NEW BRITAIN REGION, P.N.G. * there was an additional earthquake in Turkey that did not seem to be informational. If you map these quakes, they look like darts hitting a board but missing California. The more recent the quake, the closer to California they appear to become. 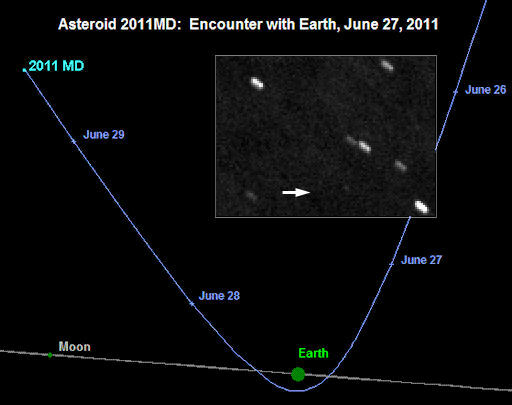 Additionally, Solar Flare 47 is expected to arrive at Earth today (June 24th, 2011) and an asteroid is going to pass very close to the us on June 27th. Could all these factors add up to a big quake in California? No one can say for certain, but the dartboard is full everywhere else! To begin, I have not had time to independently verify the authenticity of this document. Assuming this to be authentic, this is an outrage! This is not only dishonest and possibly criminal fraud, it proves beyond any reasonable doubt that he fails the "Natural Born Citizen" Constitutional requirement and is not eligible. If Obama is ineligible, We The People are not currently represented by our government as the sovereign rulers of the United States. "The transcript from Occidental College shows that Obama (Barry Soetoro) applied for financial aid and was awarded a fellowship (scholarship) for foreign students from the Fulbright Foundation Scholarship program – an international educational exchange program sponsored by the U.S. government. Grants are available for U.S. citizens to go abroad and for non-U.S. citizens with no U.S. permanent residence to come to the U.S. To qualify, for the non-US citizen scholarship to study in the U.S., a student applicant must claim and provide proof of foreign citizenship. " Occidental College transcripts provides concrete evidence to annul Obama presidency. This is an embarrassment to the country. Despite this dishonor and national disgrace, do not expect Obama to resign or step down. He will NOT bow out of the 2012 race. Mr. Obama's entire life is based upon lies and there is no way for him to face the truth now. His only alternative is to plod forward with smears and attacks. The Audacity of Hope has proven to be just audacity to spit and lie to our faces. He truly believes Americans are ignorant and easily manipulated. It can only be surmised that his supporters are viewed as a natural resource to exploit. They are only as valuable as their contribution to his personal success. Exploiting the poor and least informed voters has been Democratic bread and butter since the rewrite of history after Republicans passed Civil Rights legislation in the 1960's. The most dangerous possibility is that Obama's leftists become violent. Japan's assault on Pearl Harbor on December 7th, 1941, could be the Obama template to keep power. Japan attacked us after America, the worlds largest oil exporter, cut off oil exports to Japan. In order to secure the resources they needed, Japan attacked and destroyed our Pacific fleet. They knew we would rebuild it, but the tactic provided time for Japan to seize the oil resources in Southeast Asia and the Philippines. Violence could be used in order to fool Americans into calling for government intervention through the National Guard or other military resources. This would explain why the social engineering in the military appears to be designed to force out religious and conservative fighting personnel. The traditional military personnel ensure that the military is a force for America and not against Americans. Without the traditional personnel the military could be turned on the people. Remember that war is politics through other means and with a leader who is lacking character, virtue, and wisdom - We The People are endangered. Violence would provide power, time and an excuse to seize resources needed to implement complete control over Americans. Resources taken or controlled would include banks, industry, information, food and travel. Once these items are controlled by government monopoly the citizens become slaves to a ruling class and freedom is at an end. Glenn Beck cause of Whitehouse.Gov Waffle on Obama speech? "Over the last 15 months we’ve created over 2.1 million private sector jobs. (Laughter.)" "Over the last 15 months we’ve created over 2.1 million private sector jobs. (Applause.)" Glenn began the show with video of a White House staffer promising a solar panel powered water heater to be installed on the roof of the White House by the end of spring. That promise was made 253 days ago and today is the official start of summer. Like most other Obama administration promises it went unfulfilled. It is no wonder that the waffler in chief is now discussing pulling troops from Afghanistan. We stay in Afghanistan to appease the majority of Americans while pulling troops out to appease the radical left. What the White House needs on the roof is not a water heater, it is a teeter totter. Big Footprint: Is Green the New Tyranny? On Monday June 13, 2011, I had the honor of investigating the mystery of the big footprint at an international conference. Lord Monckton headlined the event at UCLA which included atmospheric physicists, columnists, policy directors, nuclear fusion experts, environmental scientists, geographers, philosophers, theologians, doctors, lawyers, professors and many other enlightened thinkers. It was an honor to attend and I thank the American Freedom Alliance for the invitation. A fable proclaimed that those who stare at the face of truth become blinded by the light. This analogy reveals that life is generally a dark intellectual exercise with moments of light as truth is revealed. Big truths may be the hardest to see because they blind and startle us as the proverbial light goes on. If you are staring at the light when it turns on, it can blind you. At this conference, the brightness was nearly unbearable. Some people became frustrated with the glowing intellectual discussions. It was a passionate environment of rich and meaningful debate and much of the passion came from dissenters to the discussions. Unfortunately, I only could attend the final day of the two-day event. Final day discussions included Global Warming, The Drafting of the UCLA Declaration, The Assault on Human Exceptionalism, Energy Policy: Fusion and "Alternative" Power, and Bioethics. All of which included enough truth to give the average truth seeker a sunburn. You might go out on a limb and conclude that I enjoyed the conference. What is the "Big Footprint" and is "Green the New Tyranny?" It turns out that the feelings of powerlessness in the face of an all powerful government, the sound of air sucking out of our lives, and the strangulation of blood from our economy due to massive regulation are the toe impressions from the big government footprint on our necks. Examples of these impressions are far too numerous to list, but "Green" is one. Surprisingly, "Green" is not a new tyranny. It is an old tyranny with a new name. Green is the New Red. Red is shorthand for Communist Totalitarian Dictatorship. The tyrants of the world are always renaming and rebranding. As I say, "Great ideas stick around, bad ideas go away, and the worst ideas are reborn under a new name." You have to be extremely bad to require a name change. Anthony Weiner hasn't changed his name, although it may be in progress. What was the take away from the conference? There is no audience for what needs to be expressed. Those of you who understand truth will take issue with how this is expressed. Those of you who are just beginning to understand the truth will likely get a migraine. Those of you who live in a dark comfortable life of hope and change will not accept the following. You will hate this, as do I, but it is only because the truth is so unbearably heavy. We are imperfect beings who seek comfort and warmth. We do not seek to carry a burden and what follows is burdensome, but hope also follows. If you read on and consider the following, you are a hero. You are my hero and, in the name of the Republic and human freedom, I hereto claim the power to grant a specific title. Your titles shall forthwith include Hero of the Republic of the United States of America. The conference included many perspectives, angles and strategies at disseminating the truth. Examples were used. History was told. Facts were exposed. Emotions were tugged upon. Ultimately it comes down to the fact that the eternal struggle between good and evil, light and dark, freedom and slavery and governance vs. self-governance has reached another tipping point (to use alarmist rhetoric). Sovereign Americans rely on Natural Law to establish who rules among themselves. It is this Natural Law which is referred to as independence or liberty and without it, we are not self-governing. We are ruled. Ruled by an elite political class that no longer honors even the most basic tenet of self-governance. The basic tenet is that only a Natural Born Citizen can represent and preside over his fellow citizens. Americans' sovereignty is currently usurped by the government and we are no longer a represented citizenry of a democratic republic. You were warned about this information. It is not going to get any better as you read on. Some of the best minds in the world have come to this conclusion. This is not just my opinion. For all the great minds at the conference, I apologize for putting words in your mouths, but your arguments follow. A ruling political, elitist and illegitimate class has taken the reigns of power through lies, propaganda, miseducation, misdirection, corruption, oppression, intimidation, violence and class warfare. These people are as evil as any in history. They oppose the very notion of Human Exceptionalism because they want to ensure their own positions of power. America no longer debates between emotional cries for liberty and rational calls for liberty. America is now struggling between the unique value of individuals and individual value as a commodity natural resource to be exploited and disposed. We are now chattel or sheeple to be harvested and most importantly to be made scarce for the benefit of the rulers. All the intellectual tactics being used against us are focused on winning an argument that starts with a false premise that "humans are not as important as [something alarmist]" and ends with "There should only be [insert number] people on the planet because of [insert rhetorical term]." To ensure that elitist policies are not overthrown we cannot be "allowed the illusion" of self determination. Cars, guns, health care, information, media access, food choices, energy resources and economic freedom must be centrally controlled by the political class. The most important of all freedoms to be controlled is thought which is most threatened by Religion. Western Judeo-Christian religion gives a deep and unique value assigned to the individual. This value is given by God and not the ruling class. It establishes an inalienable individual value. To make matters worse, The Bible itself is an analogy about the evils committed upon humanity by people with the exact beliefs and passions of the current ruling class. The Bible describes how to overcome these tyrants and it is the basis of America's Constitution and America's economic system. If you were a knight of old, you are now trained in what you need to know. There are many refinements to this truth and I believe in your unique abilities to find and use them. However, your intellectual armor is not complete. You must be smacked in the head once again with the truth as a reminder to wear your helmet ("keep your thinking cap on"). What I have just told you is summarized as: They see you as a number. There are more of us than them. They must balance this equation. For this, there is an example to drive the point home. In World War II, there was a reason that the Nazis did not divert all available trains and materials toward Russia even after the defeat at Stalingrad. Thousand of German soldiers had died and this tipped the racial balance in Europe. Hitler was balancing the numbers. Balancing the numbers was more important than winning the war. Consider… DDT, CFC's, environmental regulations, the lack of energy policy, CO2 regulations, financial regulation, Obamacare Quality Adjusted Life Years, outsourcing via burdensome corporate tax rates, agenda 21, animal rights, earth religion and "green job" unemployment. False religions, false science, and bad economics are not political strategy, they are tactics. "Alternative" energy is an alternative TO the market and is not a reliable, cheap energy alternative. These are tactics to separate people in to the lowest of three economic classes. As Christopher Horner describes the three classes," those who pay to lose weight, those who work to eat, and those who don't know where their next meal will come from." They are balancing PEOPLE. Real hope exists. We have a number of weapons at our disposal, but there is one that converts western liberals into free thinking Americans at an alarming rate. You can use this sword of truth on the masses of miseducated and brainwashed. At the conference, a very left biased woman asked a extremely passionate question. She asked how our propaganda was different than their propaganda. Many people shrugged and shook their heads. Hours of facts, figures and debates had not broken through to this woman. After the end of the final discussion panel, I approached the woman and asked her if she had seen Burzynski: Cancer Is Serious Business. This film documents how the FDA used its power in an attempt to destroy a doctor who developed a cancer cure in order that they could steal his patents once he was either financially ruined or thrown in jail. This is just one of millions of examples available. She had seen the movie and I then revealed the sword of truth. "We conservatives fear that the FDA, EPA and the entire government has become corrupt," I began. As individuals, we are no longer respected by our government and we are powerless against it. Our individual freedom is threatened by people who do not see us as individuals. Her eyes fixed on me and her head tilted. We had found common ground to discuss the classic debate between the factions of classical liberalism, aka those who believe in self-governance. The sword of truth is individual value. We are all unique. We are all personally invested in our own uniqueness. Adam Smith described this as your uniqueness of perspective that has never existed prior and shall never again exist. Christians call it your soul. It is your merit and your value. The Declaration of Independence proclaims that we each have a right to life, liberty and the pursuit of happiness. Everyone that wants to impede your inalienable rights is committing injustice upon you. This is the common thread. At the conference, panelist Jeffrey Schwartz made an impassioned plea that Judeo-Christian Religion is the cornerstone and basis of our argument for individual value. Wesley J. Smith and David Prentice disputed this strategy in favor of less theocratic tactics. They were all correct, but the key concept is individuality. Even if you went back in time and relived 10 years of your life, your two alternative "you" would be unique from each other in perspective. You would be changed. You would impact the world differently. The difference in the world would be, and is now, YOU - a Hero of the Republic. You don’t get a horse, so don’t ask. The Mercatus Center of George Mason University released an index of American "Personal and Economic Freedom." This study ranks American States in Freedom. The ranking is based on public policies that "affect individual freedoms in the economic, social and personal spheres." You can review the entire article by clicking either image above or the link at the beginning of this post. The report is also available as a downloadable PDF. There is also a short video available on YouTube. California congressional redistricting is showing the sad state of government. In a move that clearly favors Democrats, six Republicans are taking hits in the process while only three Democrats will face problems. Republican Reps. Elton Gallegly, David Dreier, Gary Miller, Brian Bilbray, Dan Lungren and Jeff Denham are at risk. Democratic Reps. Lois Capps, Loretta Sanchez and Jim Costa face the same issues. San Diego's Brian Bilbray of CA-50 is particularly at risk. He has been one of the few Representatives who held open townhall meetings during the ObamaCare debates. It would appear that Rep. Susan Davis (D) will lose some of her overwhelming Democratic voting block. She may have to actually campaign due to some of her more outrageous statements. For instance, in 2009 at an ObamaCare townhall she told the crowd of opponents that she would "vote her conscious." It was a clear slap in the face to her constituents who urged her to represent THEIR opposition to the unconstitutional law. Complete draft redistricting maps are available at http://redistrictingpartners.com/crc-first-draft-congress/.